The Balvenie has been developing a persona of hand craftsmanship for many years now. Rightly so as their whisky typifies the excellence craftsmanship can deliver to the water of life. But The Balvenie is not a selfish inward looking marketing monster. The brand loves to celebrate crafts people all over the world, from all walks of life, that have the same passion to think creatively and mould these ideas into something tactile with their hands. Each year William Grant & Son’s establishes the The Balvenie Craft Bar pop up in one of Australia’s capital cities. Last year say The Balvenie Craft Bar appear in Sydney and the year before in Melbourne. 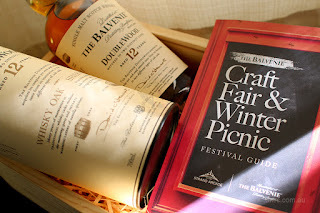 Held over 4 days from Thursday June 25th until Sunday June 28 2015, this year has seen the concept adapted, renamed and reapplied to appear as The Balvenie Craft Fair & Winter Picnic Festival. Popping up at Sydney’s iconic Strand Arcade, The Balvenie has put on a series of The Balvenie Master Classes. With only 14 places per session, the master classes were located on the 1 floor overlooking the expanse of the victorianesque location. Hosted by local brand ambassador Laura Hay, revellers tasted 3 of The Balvenie’s finest core whiskies paired against a choice selection nibbles, oils, cold cuts, dips and breads created locally from The Strand Arcade’s artisanal proprietors. The whiskies tasted were: The Balvenie 12yo DoubleWood paired with candied crusted macadamia nuts from The Nut Shop; The Balvenie 14yo Caribbean Cask paired with a wedge of creme brûlée and short crust pastry from Sweet Infinity; The Balvenie 17yo DoubleWood paired with a chocolate from from the Haigh’s Chocolates. A nice pairing of all and when combined with the additional food stuffs all we were missing was the red and white chequered blankets, bags of lettuce, and lashings of ginger beer to complete the picnic theme. Tickets to the master classes were $15 with all funds being donated to charity. If punters failed to get a space in master classes The Balvenie pop up bar was displaying on the ground floor at the main entrance to The Strand Arcade off George Street. Visitors and passers by could stop for a quick dram and shortened master class with our other fondly know brand ambassador from Melbourne, Richard Blanchard. Serving small tastes of The Balvenie 12yo DoubleWood guests were welcome to take their dram and explore the various artisan displays put on by The Strand Arcade stores. The match up with The Strand Arcade was an excellent idea as it allowed the guests to take in the craftsman in an environment we are all naturally prone to explore. I love going to the Strand Arcade whenever I am in town and where ever possible utilise the arcade to cross through the city just to have a look at the stores on the way through. I hope we get to see The Balvenie appear here again, maybe for a mid summers eve supper (hint hint). Top marks to The Balvenie and The Strand Arcade for a perfect winter festival.